AM-72-044: Two brass rods and PE fret with six pieces. AM-72-045: Two brass rods and PE fret with six pieces. 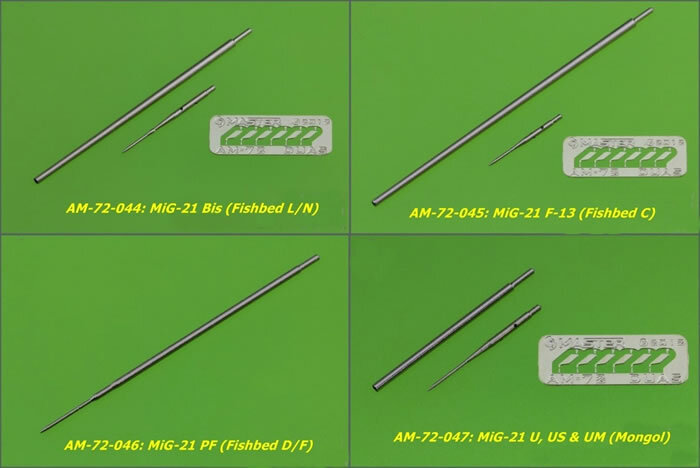 AM-72-047: Two brass rods and PE fret with six pieces. AM-72-050: One brass rod and one brass stub. Please click here for a a links to numerous other global stockists. Exquisite scale finesse, superb quality, very good instructions. 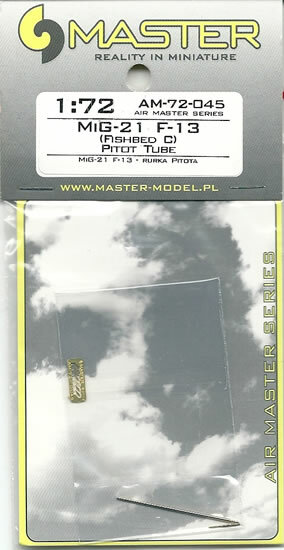 Master Model’s brass pitot tubes are of excellent quality, superbly rendered, well packaged, and come with good instructions. They are without doubt a class act that enable average modellers to achieve a level of scale finesse previously the preserve of masters (with their pitots at least!) – Highly recommended. If ever there was review where pictures replaced the need for words, then I think that this must be it. However, a few words are still probably in order. Many jets, especially those of cold war Soviet origin, have quite elaborate pitot tubes that are beyond the ability of injection kit makers to replicate. This is certainly the case with my preferred (and one true) scale of 1/72nd. 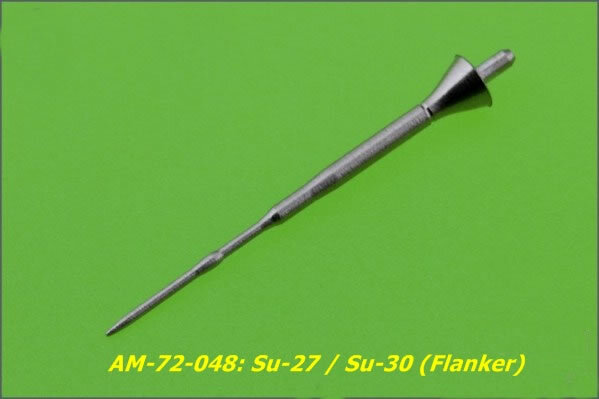 Many resort to scratch-building using stretched sprue, hypodermic needles and wire to create more refined pitots for their models, but in the case of Russian examples replete with small vanes, this is still sometimes a compromise. 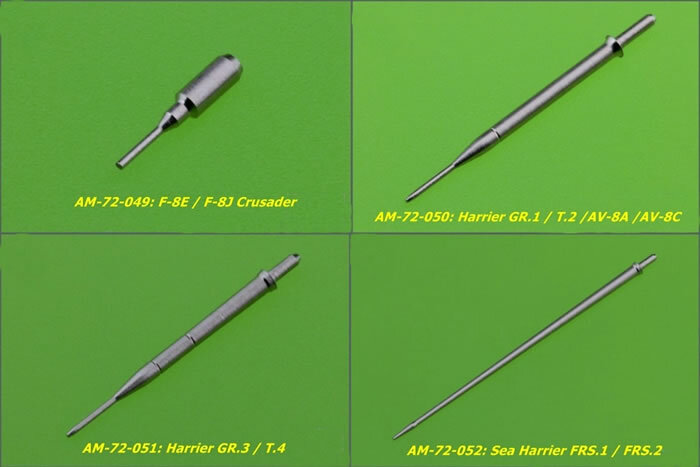 The Polish company of Master Model has however come to our rescue with an incredible range of correctly scaled brass pitot tubes. Each pitot comes well packaged in a little resealable cellophane bag, which, along with a folded sheet of instructions, is further enclosed in a small zip-lock plastic bag. This outer bag is stiffened with a card insert to protect the contents from bending, and is topped off with a stapled card header. The instructions are clear and thorough. 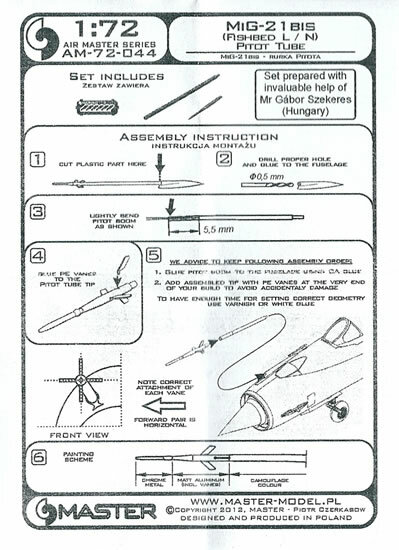 They identify the size drill-bit required, illustrate the assembly of the pitot (if required), angles of deflection and orientation (if applicable), advise on the best adhesives to use, and provide clear painting instructions covering the different finishes to various sections of the pitot tube (again, if applicable). These exquisite replacement pitot tubes will add considerable scale finesse to their intended subjects. In 1/72-scale at least, they may prove too fiddly for some, as the parts are very small indeed in some cases. In addition, I would advise extreme care not to drop them, as the carpet monster will not relinquish them if they roll off the modelling bench. Thanks to Master for the review samples.